I am Agent 47, tasked with infiltrating and eliminating Viktor Novikov and Dalia Margolis, ringleaders of the international spy organization IAGO. I walk through the main entrance into Palais de Walewska as guests and staff alike compliment my suit. Someone says I look remarkably like Helmut Kruger, the star of today’s fashion show. I turn right, right, left, and enter the first bathroom. There will be an invitation by the sink- an invitation that will allow me upstairs as a guest of the auction. I hide my silenced pistol in the trashcan and head through the garden to the back entrance. A security guard asks for an invitation. I show him the one from the bathroom. Two right turns and another set of stairs. Left and I get frisked. “Just standard procedure” the guard says and thanks me for my cooperation, my gun safely hidden away. Left, two doors, and there’s the auction. A circle of chairs filled with suits, an auctioneer announces the next invaluable piece of information for sale. I find my seat. A woman will walk over and say we’ve never met. I will introduce myself as Mr. Rieper, and chuckle at the joke because I know I’m going to kill her. Maybe I’ll use the fiberwire this time, maybe the letter opener on her office desk. I decide to drown her. I leave the auction and no one notices. No one notices when I hang from a balcony and shimmy my way to her bathroom either. There will be two guards in the next room, a security team member and a personal bodyguard. A radio and overflowing sink draw both into the bathroom while I climb out of a closet and dispatch them both. I hide them in the same closet. Dalia leaves. I shake some rat poison into her glass of wine and wait for her to return. She will notice a guard missing and mutter something about it. She will drink the wine, run into the bathroom, and bend over the toilet to throw up. I will drown her and not bother hiding the body, because I know no one else will enter the bathroom. All of this happens exactly as planned. This is the seventh time I’ve completed this mission, or maybe the eighth? I’ve lost count. It’s never gone this smoothly before, I remember my first time at the Palais as a complete mess. I was lost in the sprawling mansion and grounds, bodies of guards and guests alike traced my path. Some were hidden in a nearby trash bin, others left behind some shrubbery. I didn’t know where the targets were or where they would go. I didn’t know when the servers would take a smoke break, or which ones were employed long enough to recognize I wasn’t one of them. I didn’t know anything at first, and it was absolute chaos. 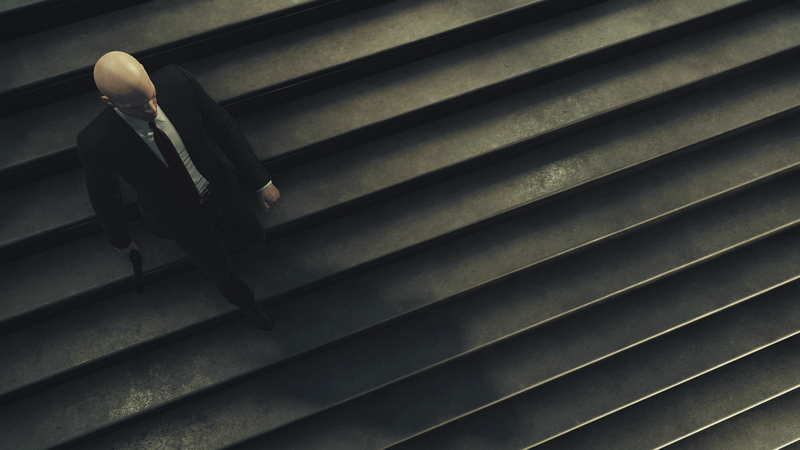 After completing a mission for the first time, Hitman encourages you to complete it in a different way. Try dropping the stage lighting on Victor, try imitating Helmut Kruger to gain audience with Dalia, or try sniping them both as they watch the fireworks show along the river. The fireworks show, of course, that you set off. These challenges ask you to play the stage over and over again until you become intimately familiar with it. I predict, direct, and execute my plan, or fall back to plan B in case of an emergency. Replay after replay and I truly become a professional assassin. I become Agent 47. For me the thrill doesn’t come from the hit although some of them range from ridiculously funny to downright badass. I’m asked to pay attention, to think critically, and to engage with a depth other games seem to skim over. I take mental notes on positions, timing, events, drinks and conversations, because these things are all important. I become immersed in the incredibly detailed clockwork world and learn to manipulate it. It’s my understanding and experience that makes me so adept at my job, but the learning process is the true reward. Things fall into place, a bigger picture slowly forms in my head, and I dive deeper and deeper into the machine. Unfortunately, that journey doesn’t last forever. There comes a point where I feel like I know all there is to know. Things become routine and even tedious, I make the same motions but take nothing new away. At this point I know it’s time to move on. I start from the bottom again tossed into a foreign land with foreign targets. Things are refreshing and new. A surprise waits behind every locked door and in every out-of-place item. I explore as much as I can, go sightseeing, look for cans of expired spaghetti sauce, and eavesdrop on weird conversations. I pause to savor the unfamiliarity because I know the journey ahead of me. I pause and hope that this time it’ll last just a little bit longer, because I know the journey really is the best part. This article was written by @indianakuffer – check out his bio on the contributors page.